Scope and Content Horizontal water mill, South Shawbost, Lewis, Ross and Cromarty Mills with horizontally-mounted wheels were widely distributed in early historic times. By the late 19th century they were only found, in Scotland, in the Outer Hebrides, the north west mainland, Orkney and Shetland, most commonly in Lewis and Shetland. This view shows the interior of a mill restored to working condition from a badly decayed structure by local school students in 1968-9. 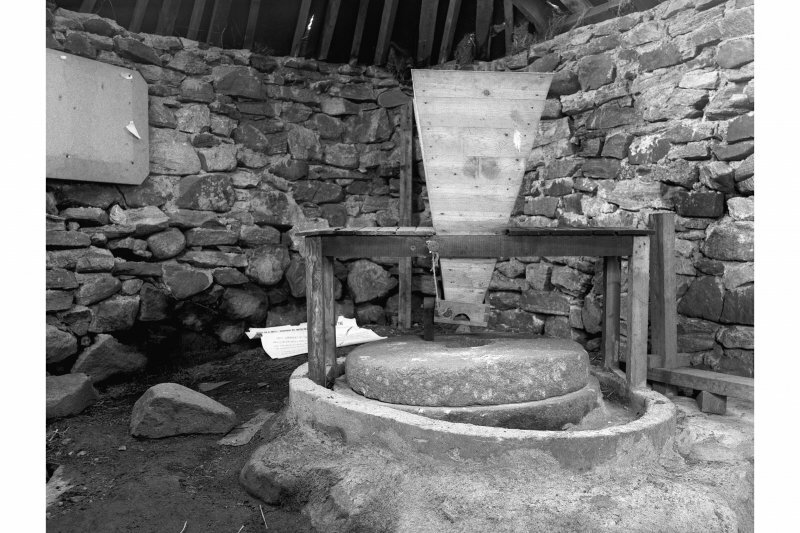 The wheel is below the millstones, driving the top stone directly. Meal collected in the groove round the stones. In Lewis such mills were known as 'black' mills, and supplied the needs of a few families. They cost little to build, and did not require large quantities of water. Most went out of use from the late 19th century. Source: RCAHMS contribution to SCRAN.